Curing is one way to preserve food by providing a combination of preservative ingredients such as salt, nitrates, nitrites, sugars, and other ingredients that can add flavor, which is usually done to preserve and give flavor and color to food, especially meat, fish, or vegetables. 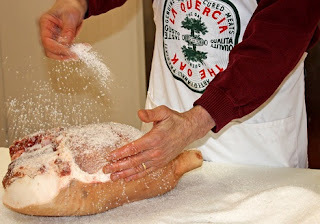 Curing in meat requires salt which is the first food preservative used by humans. Salt has become an important ingredient in preserving livestock and fishery products. At a certain level, salt prevents the growth of certain types of bacteria that are responsible for decaying meat. Salt can prevent bacterial growth, both caused by the inhibitory effects directly from bacteria and by the drying effect of bacteria in meat.